To IPO or Not IPO? Last week, it was reported that Currencies Direct (private equity owned) were exploring a stock market listing later this year. With so few public companies in the space, we thought we’d take a look at how the public markets are viewing the sector. Many of the current fintech players have been around for a decade or less and over the next five years, we expect to see a lot of exits as private equity or venture capital groups begin looking to cash out. To gauge how companies are valued in the space, we looked at the current price to sales ratio (P/S) of five public payment companies alongside some select recent transactions and fundraisings. We chose this metric as it gives a gauge of how the market sees future growth and unlike a price to earnings ratio, is not skewed by companies that are not profitable or whose current target is primarily growth. The first observation is that investors in the payment space appear focused on raw growth potential and are offering very high valuations to those groups who may still be early on in their perceived journey. Despite a new digital push and increased website transfers in Q3, Western Union doesn’t even hit a 2X multiple. That’s far lower than other (larger) established companies command – Amazon for instance still has a P/S ratio of five, despite their $100b+ revenues and massive size. 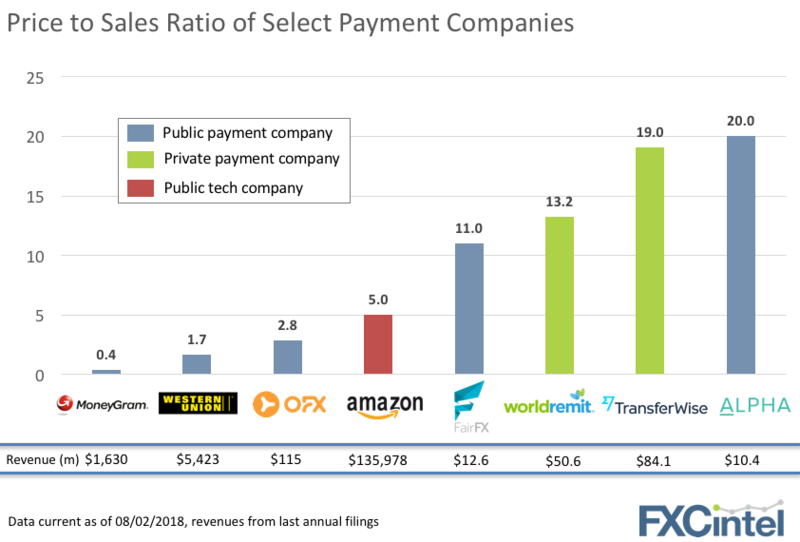 Transferwise meanwhile, which has revenues not far short of OFX, has a P/S ratio of 19 (although this is in the PE/VC world, not among stock market investors). Alpha FX Group, a specialist corporate FX and hedging player who went public last year, has the highest multiple of all on a base of just over $10m in revenue. IPOs can have the benefits of allowing initial shareholders to retain ownership, more openly incentivise employees and provide a public profile for the company. So far though, few companies in the space have chosen this path. In a piece of news you may have missed, Alibaba announced they would acquire a formal 33% stake in Ant Financial – their long-standing payments affiliate. Key things to remember here – Alibaba is now a U.S. listed public company, and this move helps pave the way for Ant Financial to launch a potential U.S. listing of its own. It also reduces Chinese ownership of the company from over 75% to 51%. Ant Financial’s ownership and ties to the Chinese government were key sticking points in the recent rejection of their proposed takeover of MoneyGram. Could this move set the stage for an eventual second takeover attempt, either as a U.S. listed company or through Alibaba? Based on the state of MoneyGram’s stock since the merger fell through, we expect it’s a possibility MoneyGram is keeping an eye on.